Any wood that you burn needs to be well cured or dry. The moisture in green wood robs your stove of efficiency and deposits creosote in your chimney. Creosote is what causes chimney fires that can burn down your home. Buy or cut your wood a full year in advance to insure that it has time to cure properly. You may want to consider keeping two years worth of wood on hand to insure you have enough each burning season. The best way to keep your wood dry is to store it in a wood shed. If this not possible you have to stack it somewhere and keep it covered from the weather. You shouldn't stack your firewood on the ground. An easy solution is to find excess pallets from a local business and stack your wood on those. 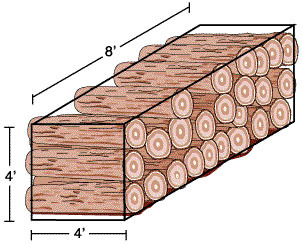 Wood should be stacked so that air can reach all of it and then covered. If you use a tarp to cover the wood remember that air still needs to get in to dry the wood out. Stacking on pallets can help with this too. When you stack rows beside each other leave space between them (6-12") so the air can circulate to dry the wood. Hardwoods such as hickory contain more energy per cubic foot than softer woods. They are denser and will burn longer cutting down on the number of trips you have to make to the woodpile. Fat woods such as pine can be used as fire starters, but should not be used as your primary fuel because they will cause creosote problems. If you buy your firewood ask your supplier what type of wood they are bringing you. Insist on wood that has been cured for a year or buy the wood a year in advance and cure it yourself. Make sure that you ask about the way the wood is cut to length and how it is split so you know it will be suitable for your stove or fireplace. You don't want to pay for wood that you can't use. Burning smarter or more efficiently will make your supply of wood last longer and keep your chimney cleaner. A more efficient stove might be an option. No matter what stove you use, always use a thermostat on the stovepipe where it enters the thimble or as close as possible to this point. Your flue gases should be entering the flue at a temperature of 250–475 degrees Fahrenheit. Experiment with your damper settings on your stove so that you keep the gases in this range. When you damper the stove down too far you risk depositing excess amounts of creosote into your chimney. Also, keep your stove clean. Remove excess ashes from the stove regularly to prevent clogging and a smoldering burn. You always want to see flames in your fireplace or wood stove when you are burning. The flames burn the smoke and result in a cleaner chimney with less smoke output. The standard term of measurement for firewood is called the "cord". A "cord" of firewood occupies approximately 128 cubic feet when stacked neatly in a line or row. A standard cord of wood measures 4-feet wide by 8-feet long by 4-feet high as shown below. Buy your wood by the cord or a partial cord to avoid ambiguity in the amount of wood you are purchasing. When your wood arrives, stack the wood and measure exactly how much you received. If you didn't receive the amount you paid for contact your supplier. Take a picture of the stacked wood with an object of known size next to it so you can show them if they dispute your claim. It is also a good idea to write down the license number of the delivery vehicle when they arrive. Check to make sure your damper is open. Lay your fire starters in the floor of the stove or fireplace. Loosely balled up newspaper works well. You can also use dry bark, fat wood, or wood shavings. Loosely stack kindling on top of your starters, leaving space for the air to circulate. Stack some larger pieces of wood on top of this pile, supporting it with other pieces so you don’t crush your starters. You want the flames to easily reach this wood so it will ignite. Check to make sure that your chimney is drawing and not putting air into your house. If your chimney is not drawing, hold a piece of lit newspaper up into the flue opening or as close as you can to the stove outlet inside the stove to get the draft going. Light your starters in several locations starting with a point farther away from you and working your way towards yourself. If you have a stove open the air control dampers all the way before closing the door(s). Allow this starter fire to burn freely and add wood as needed until you have established a bed of coals. Once you have established a bed of coals in your stove or fireplace, you can reload wood to the fire as needed. Keeping the fire going is a fairly straightforward process. Keep track of your fire. When it burns down to coals and some smaller pieces of wood it is time to reload. Rake the coals inside the stove towards the air inlet dampers and then load the stove. You want to fill the stove completely, but you don't want to pack the stove. Leave enough space for air and flames to circulate around the pieces of wood. Leave your air supply dampers fully open to allow the fire to get going again and then adjust them to control the size of your fire. As mentioned above, a thermostat can very helpful. And remember, you want your fire to have flames for better burning. When reloading your fireplace, rake the coals so that they are underneath the wood you are loading. Load the wood into the fireplace leaving space for the air and flames to circulate around the pieces. When lighting or reloading this type of stove the bypass damper is opened to divert colder air away from the catalytic converter. These stoves need to be allowed to heat up high enough to reach an operating temperature for the catalytic converter unit, typically this around 500-degrees Fahrenheit on the top of the stove. The catalytic converter will burn the smoke a second time at these temperatures increasing efficiency and reducing emissions from your stove. Once your stove has reached it's operating temperature close the bypass damper so the smoke will pass through the converter. When reloading these stoves, rake the coals so that they are spread evenly throughout the bottom of the stove. Load the wood, fully filling the stove. Leave the air supply dampers open until the fire gets going as before. Once the fire is going and the stove is at it’s operating temperature close the bypass damper and adjust the air supply dampers to control the size of your fire. As mentioned above, a thermostat can very helpful. And remember, you want your fire to have flames for better burning.